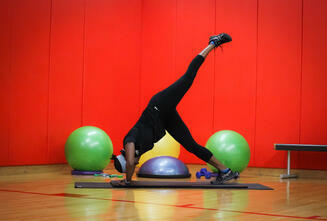 This week we are going to tone and work the upper body while stretching out the lower body. It's important to remember to stretch your muscles to prevent tightness and improve range of motion through your joints. As we age and become less active your joints become stiff, if you continue to incorporate stretching into your routine your body will stay limber and help reducde pain and discomfort. Remember, it's always important to warm up the body before a workout. 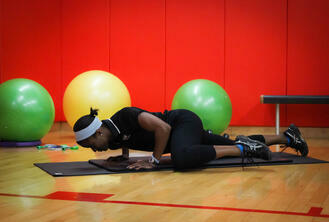 Check out Free workout Friday's every week by subscribing to our blog! Mandy Kisamore was a little reserved when we first met. She is not a jump in the front of the room type of person. She came to a few classes and then became more of a regular. After a while she started to hang around after class and ask questions that began with her and then shifted toward her children, and her family. She has done a lot of work from when she started and it hasn’t stopped with her. 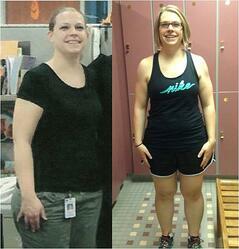 Check out her story about how she transformed herself and her family. It has been extremely rewarding to be able to be a part of Mandy’s success. Exercise was not one of my favorite things to do. It was never fun; I would never look forward to it, or hate to miss a class. Today is a different story. Three years ago I started to get serious about taking care of myself. This transformation has been, and continues to be, a struggle that I have to work on at every class, at every workout, and every time I exercise. Here is my story. In the beginning, my family and friends would always tell me that I needed to find some “me” time. Having a husband and two kids at home, finding “me” time was the last thing I thought was a possibility. After thinking about this “me” time that I apparently needed, I decided that I would start checking out the gym at work and the classes that were offered. I thought that would be something positive for me, mentally and physically. That could be my “me” time, one night a week for 45 minutes. Of course going to the gym itself is overwhelming, and joining a class for the first time was terrifying for me. I found myself frustrated during the past three years because the scale did not tell me the number I wanted it to. I have had to shift my thinking to look at the inches I have lost, the new pants I have had to buy, the muscles I have built, and the confidence I have gained. During the past three years I have had some setbacks which were frustrating, but I know that I cannot stop now. I feel that I have come so far that giving up and going back to where I was is not an option for me. I started with a lower body class, it was only 30 minutes and who doesn’t want a better back side? A few friends and I started going to the class together. It was definitely a good decision to start with people I knew. To my surprise, I ended up enjoying the class and started going once a week. I attended this class for a month, and then added two classes a week for the next month, then three a week the next month. I soon found myself going to as many classes as I could fit into my schedule. As time went on, I could feel how much better I felt inside, and I could see the changes that were happening to my body. These helped me stay motivated and continue trying different exercise classes. My motivation to keep pushing through and continuing to make this more of a lifestyle change than what started as just a way to find “me” time is definitely my family. To see the changes and the positive thought process this “me time” has brought to my family is amazing to see. At one point during this journey my son said he was proud of me. That was such a motivator for me to keep going no matter how hard it was, or how much I didn’t think I could keep up with it. Since then, my kids have started paying attention to their eating habits, and exercising because they want to. My husband, sister, and father have been making changes to be healthier as a result of what I have started. It is wonderful to see that what started as one group fitness class has turned into a positive change for my entire family. To me, every positive change you make is a success, whether it is stepping foot in the gym, joining your first class, or trying a healthier meal out on your family. These changes can lead to so many more positive changes in your life. Although I haven’t reached my initial goals yet, I have found the smaller goals I have made are just as important. I have to remind myself of what I’ve already accomplished, and that I am a work in progress. I am going to keep trying to be a better healthier me, for myself and my family. Interested in helping your employees make great strides in changing their habits to live healthier lives? 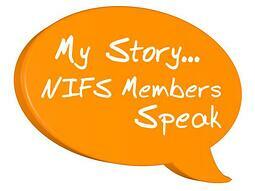 Checkout NIFS Fitness Management Services to see how we help your workforce. Bodyweight exercises are trending in 2015. If you missed last week go back and check it out. Now it's time to crank up your bodyweight workout from last week? We have another workout for you. Before you begin this workout, make sure your form and technique for each exercise is correct first. You want to get a good workout in while avoiding injuries. Watch the video for correct form and technique. Instructions: Complete 3 sets of each exercise with a 30 to 60 second rest in between sets. It's importatnt to stay hydrated when working out. Make sure your water bottle is close by; you’ll need it! This is the story of a man, who by all accounts, has received a challenging diagnosis, and who, by any standards, could have slowed down years ago. 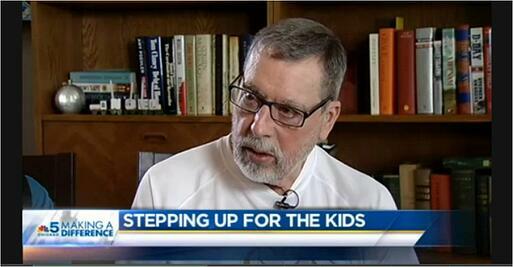 But he hasn't, and instead, he's overcoming his health challenges to help patients at Lurie's Children's hospital through the Aon Step Up For Kids fundraiser. Larry Pirovano, a resident at The Clare, in downtown Chicago has been working with his NIFS personal trainer, Zach DeCoster to accomplish the stair climb challenge that required more than 1,600 steps. We've got his amazing stats below as well as a video from a local NBC affilate who profiled his inspiring story. On January 25, 2015, Larry and Zach climbed 80 flights of stairs in the Aon Center in 50 minutes and 15 seconds. Larry placed 2nd in his age bracket. He raise the most money of all individual participants and was 16th in total fundraising including all teams and individuals. The cold weather is here in full force. Not only does it bring snowmen and hot chocolate, but also more aches, pains, and for many, the cold weather blues. It is known that the change of season can cause depressive feelings. Don’t let that happen to you, here are a few tips to get through the cold weather this year feeling your best. Stay physically active. 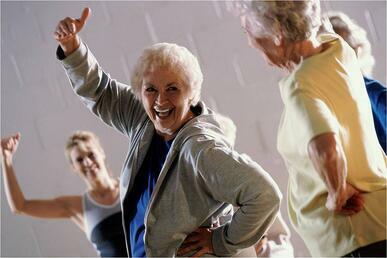 Regular exercise can help boost both your mood and immune system. 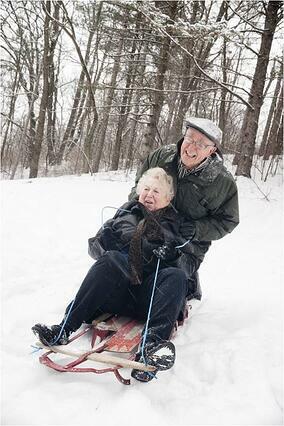 There are so many ways to stay active during the winter. Do what it is you enjoy doing most. Whether it is participating in group exercise classes in your community, going to the fitness center on a regular basis, getting in the pool for a swim, or maybe it is walking through the halls. Try to pick an activity that increases your heart rate but allows you to still hold a conversation. This is a great way to monitor your intensity level when working out. Eat healthy. Winter typically can trigger a “hibernation diet,” one full of sweets and high fat food. Try to avoid that. Eating the proper foods can be beneficial to both the immune system as well as emotional well-being. Omega-3 fatty acids, “the good fats,” have been shown in studies to reduce depression and the associated symptoms. You can consume Omega-3 fatty acids in foods such as walnuts, salmon, and flaxseeds. Vitamin D is also helps boost energy levels. Lastly, remember to drink enough fluids to stay hydrated. During the winter it is easy to drink less, but your body still needs water to functional optimally. Stay involved in your community. Avoid staying alone in your apartment all day. It doesn’t matter what you choose to do, stay connected because you will benefit both emotionally and psychologically. Consider socializing with a new resident, having dinner with friends, volunteering, taking up a new activity, or joining a club. Keeping yourself busy will fill your days with activities and socialization. Let the sun in. Keep the blinds open in your apartment and take advantage of the natural heat that the sun produces. Not only does the warmth feel great, but sunlight is a free mood enhancer. Sunlight encourages our body to produce Vitamin D, which can control feelings of satisfaction. The sunlight also regulates our melatonin and serotonin hormones. These are chemicals that the brain releases to control mood. Embrace the season. Winter might not be your favorite season, but do your best to accept and enjoy the beauty of what it brings. Try to avoid talking and thinking negatively about it as much as possible, and encourage others to do the same. Researchers say that positive thinkers are often healthier and less stressed. Making just a few small changes can end up helping you immensely; start incorporating them into your current lifestyle today to see for yourself. Spring flowers and summer nights will be here before you know it, but for now, enjoy the winter! Check out this blog post about wellness and how it's not just exercise, it's multi dimensional. Instructions: Perform 2 to 3 sets of 10-15 reps for the following exercises. You can rest for about 30 seconds in between each set you complete. Don’t forget to add your favorite music to your workout! It makes it more fun. Check out this previous blog post about using music to move more! 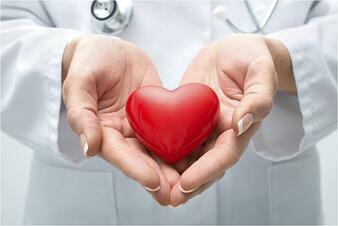 Let’s begin by asking a generalized question - How familiar are you with your heart and its functionality? February is Heart Disease Awareness month, but spreading awareness about the disease is not only limited to this specific month. Heart disease is the leading cause of death in the U.S., which is an umbrella term that includes atherosclerosis, heart attack, stroke, heart failure, arrhythmia, and heart valve problems. Heart disease can affect a person of any age, so learning about prevention tips and implementing them into your life can be beneficial. Although we lack the power to change some risk factors, we can start by making small life choices like a healthy eating plan and being more physically active. The American Heart Association breaks down prevention tips by age groups. 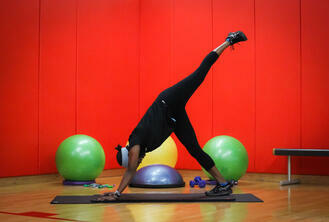 See where you fall and what you need to being doing to help reduce your risk for heart disease. The bottom line is to change your unhealthy behaviors - clean up your dietary patterns, get active, and don’t put off your necessary doctor appointments. 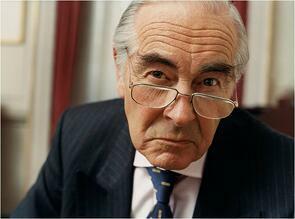 The risk of heart disease increases as you age, so the earlier you are aware, the better. The staff in your corporate fitness center would be more than happy to help you get started with an exercise routine and are available for consultations. They are there to help and guide you, as well as get you familiarized with what is offered in your fitness center. These are just the basic guidelines to a happy and healthy heart! The first Friday in the month of February is National Wear Red Day. Help bring awareness by wearing red to show your support. For more tips and resources follow us on Facebook or Twitter. If you enjoyed reading our blog, subscribe to receive new posts directly to your inbox.